White opal: With a cloudy white surface, this kind flashes of vibrant rainbow hues. Black opal: Considered to be the richest in hue of them all, this variety has a blue, black, or grey surface, which makes the shifting colours all the more grand. Crystal opal: Made of a crystal-like clarity, this kind projects sharp blasts of changing colours. Our collection is where all the charm lies. You’ll find some of the most remarkable pieces flaunting marvellous designs and highest grade of opal. Our scintillating beauty in range is spoken highly of, considering the long-lasting quality. Find unparalleled sense of richness with our open-end opal bangles, floral opal bangles, or even opal bangle watches. There is something suiting to all your requirements. The use of the most godly metals is a whole new array that you’ll swoon over. We use the purest wearable form of gold in the tinges of white, yellow, and rose (9K, 14K, 18K,) platinum (950-grade,) rhodium, silver, and a whole lot of others. Take your suiting pick – or perhaps more- and sweep in all the compliments flowing your way. 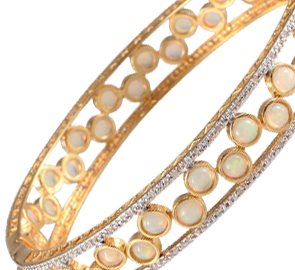 Opal bangles online in UK are available in a whole plethora of choices and ranges. How would you know where to shop? What gives you a reason to come shop with us? Well, we’re prepared to woo your senses with our inspiring collection and you can take our word for it. TJC is name that is well-known in the market for resourcing authentic and genuine high-grade gemstones to mould your favourite jewellery pieces. With a superior range of designs beautifying the opal bangles in UK, you’ll remain wordlessly awed at the richness of our quality. We bring you low-priced and affordable opal bangles that look luxurious and priceless as they swathe you with their bespoke excellence. Another quality that keeps us ahead and apart from the competition is the pricing of our features. We promise you keenly reasonable pricing of the glory, which will make it easier for you to shop for a lot for so little. That said, this isn’t where your shopping ends. We have a lot more to offer than the range of bangles. Our massive collection has the kaleidoscopic excellence of opal studded in rings, earrings, pendants, necklaces, brooches, and so much more. In fact, not only opals, but we have a swarming collection of many more gemstones at jaw-dropping prices. So, come over and shop. You’re just a click away.